PG-13 was in the MVP conversation until a shoulder injury derailed his shooting touch. Now, his health is the Thunder’s biggest concern against the Blazers. The Thunder and Blazers are two teams looking to recover from embarrassing first-round defeats last year. The stars on each club especially are looking for redemption. Portland could breathe somewhat of a sigh of relief after Game 1's 104–99 win, ending a 10-game playoff losing streak. Still, the Blazers need to prove their explosive backcourt can translate into postseason success, and Damian Lillard and C.J. McCollum are trying to reward the faith of a front office that refuses to break up the team. Russell Westbrook needs to show he can win without Kevin Durant, and win playing his wholly unique brand of basketball. And Paul George is trying to shake off the shame that comes with giving yourself the nickname “Playoff P” and then shooting terribly in an upset loss to a squad of upstarts. George looked well on his way to redeeming himself this season. He was the third banana in the MVP race for much of the year, contributing lockdown defense on one end of the floor and lights-out shooting on the other. When George was at his best, he was basically shooting at Steph Curry levels of efficiency, the Thunder had the best defense in the NBA and OKC appeared to be a lock for a top-four seed in the West. Then, George injured his shoulder during a Feb. 26 game against the Nuggets, and the stats paint a bleak picture of what happened next. From the night of his injury, however, the Thunder’s season pivoted in a different direction. George connected on only 33.8% on threes from Feb. 26 onward. His catch-and-shoot percentage dipped to 38.3%, and his pull-ups cratered all the way to 28.4%. Before the shoulder trouble, George was shooting (a probably unsustainable) 45.3% on what NBA.com described as tightly defended threes. After, he shot only 30.8%. As George’s numbers dipped, so did the Thunder. OKC’s net rating with PG on the floor was only 2.7 post-injury, which would have fallen outside of the top-10 teams in the regular season. The Thunder slipped to the sixth seed, and that’s how they found themselves on the road to start the playoffs. George is the Thunder’s most important player. He overtook Westbrook this season thanks to his two-way dominance. Westbrook’s inefficiency prevents him from being a clear-cut, tier-one superstar. George was pushing through that barrier for much of the season, and now, apparently barely able to lift his shoulder above his head, he’s supposed to be leading OKC in the postseason. 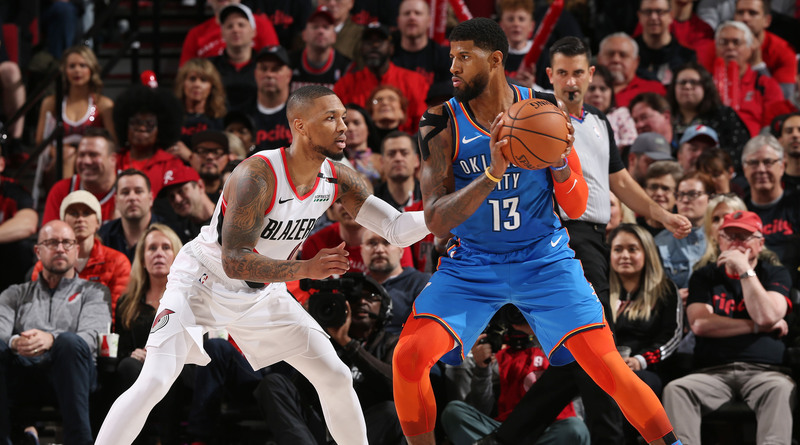 The first round will be its own battle, but even if the Thunder somehow manage to survive, if they want to put any kind of scare into the West’s elite, they desperately need George to regain his midseason form. Simply put, OKC is in dangerous straits against Portland with PG at less than 100%. And the Thunder will have a tough time putting a scare into the conference elite if they manage to advance and George still isn’t playing well. The Thunder aren’t dead in the water. They certainly can still salvage their series against the Blazers. But George’s shooting struggles have long moved past concerning trend into legitimate problem. 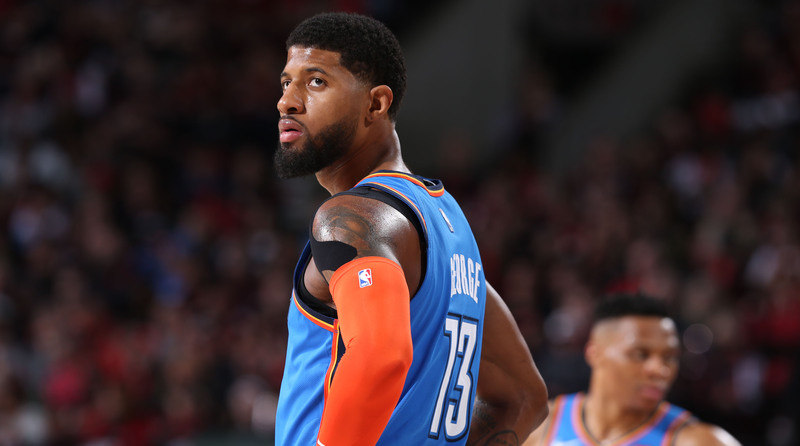 If PG’s body doesn’t cooperate, or he can’t find a way to account for his failing outside shot, then he and his team may have to wait yet another year to find redemption.